The chalets are located in a beautiful landscape and are fully furnished. You have the choice between mobil homes and chalets for 2 to 6 people. To book over two nights. In high season only weekly from saturday to saturday. Pets are allowed only on request. Bedroom with double bed with simple duvet and pillows and bedlining. The kitchen is in the hallway with gas stove, refrigerator, dishes, dishwasher and coffee machine. Living room with table and chairs and a convertible couch. TV with Satellite Receiver. Bathroom with shower, toilet and sink. Garden furniture. Room with a height-adjustable double bed, wardrobe, alarm clock and TV. Vathroom with shower, sink, toilet and hair dryer. Dining room with taibel and chairs and a kitchen with stove, oven, refrigerator, dishwasher, coffee maker and dishes. Garden furniture. 2 bedrooms each with simple duvets, pillows and sheets. Parent’s room is with double bed and children’s room is with bunk beds. The living room is with sofa and dining table. Kitchen in the hallway area with gas cooker, refregirator, dishwasher, coffee machine and dishes. TV with Satellite Receiver. Bathroom with shower, toilet and sink. Garden furniture. 2 bedrooms each with simple duvets, pillows and sheets. Parent’s room is with double bed and children’s room is with bunk beds. The living room is with dining table. Kitchen in the hallway area with cooker, refregirator, dishwasher, coffee machine and dishes. TV with Satellite Receiver. Bathroom with shower, toilet and sink. Garden furniture. The Mobilheim Life is barrier-free and suitable for wheelchair and baby carriages. 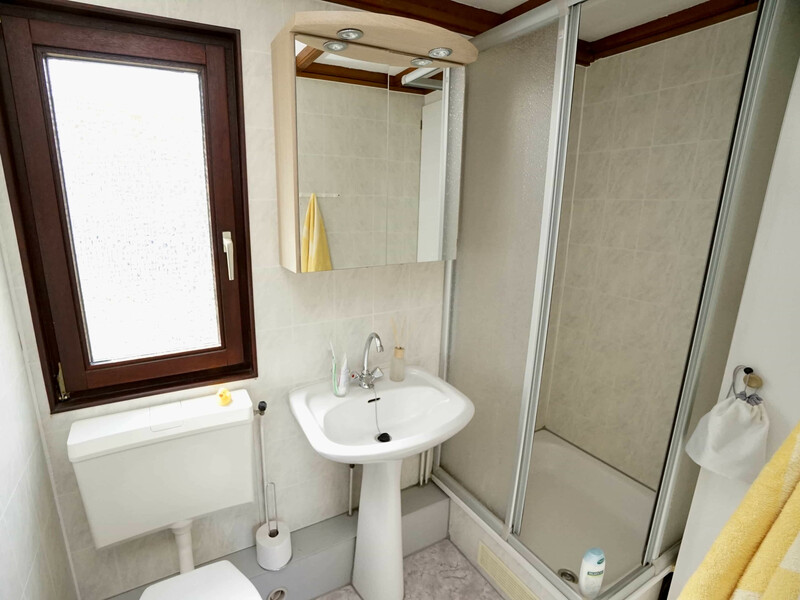 Two double rooms each equipped with a height-adjustable double bed, wardrobe, alarm clock, TV and also a bathroom with shower, sink, toilet and hair dryer. Between both rooms there is a kitchen with stove, oven, refrigerator, dishwasher, coffee maker, dishes and seating corner. Garden furniture. 2 bedrooms each with simple duvets, pillows and sheets. Parent’s room is with double bed and children’s room is with bunk beds and a baby bed. The living room is with sofa and dining table. Kitchen in the hallway area with gas cooker, refregirator, dishwasher, coffee machine and dishes. TV - Satellite Receiver. Bathroom with bath-shower, toilet and sink. Garden furniture with covered terrace. 2 bedrooms each with simple duvets, pillows and sheets. Parent’s room is with double bed and children’s room is with bunk beds and a simple bed. The living room is with sofa and dining table. Kitchen in the hallway area with gas cooker, refregirator, dishwasher, coffee machine and dishes. TV with Satellite Receiver. Bathroom with shower, toilet and sink. Garden furniture. 2 bedrooms each with simple duvets, pillows and sheets. Parent’s room is with double bed and children’s room is with bunk beds and a simple bed. The living room is with sofa and dining table. Kitchen in the hallway area with gas cooker, refregirator, dishwaher, coffee machine and dishes. TV with satellite Receiver. Bathroom with shower, toilet and sink. Garden furniture. 3 bedrooms each with simple duvets, pillows and sheets. Parent’s room is with double bed and children’s room is with bunk beds and a baby bed. The living room is with dining table. American kitchen with cooker, refregirator, dishwasher, coffee machine and dishes. TV with Satellite Receiver. Bathroom with shower, toilet and sink. Garden furniture with covered terrace. Only the towels have to be brought. The rental must be clean and tidy by leaving. All the prices include water, heating costs and electricity. The bedlining is included. only the towels have to be brought. After your departure, your location will be checked for cleanliness and damage caused. If necessary, you'll be informed by writing and we will charge you the amount of 50,00 €. Enjoy your holiday till the end and choose for letting cleaning your location by us at the end of your stay.